My husband took this picture while he was at work early in the day. Nothing paints like the sky. It's always a new canvas every day, and almost always, no two sky views are the same. We just came home from watching Wanted with James McAvoy and Angelina Jolie. What an entertaining movie. Love it. I just love it. I want more of the same. I don't think I'll ever get tired of watching good action movies. I'll probably try to take my kids to see Wall.e tomorrow before 12, before piano lessons, and before hurricane harbor trip. 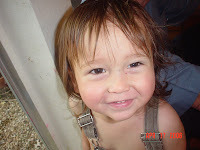 I must mention...my son, Yossi is going to be 4 years old today, Friday. This is Yossi. Happy birthday sweetie! For more on sky watch, visit Tom. And Happy Birthday to Yossi!! Beautiful sky. Happy birthday to your son. Oh no, cried blog world ... he's back! But guess what, I'm glad I decided to make a comeback. If I didn´t rejoin SWF I would never have the chance to see this great photo! happy SWF and even more Happy BIRTHDAY to your great little son! I like the faint rays that radiate from the center. Happy Happy happy Birthday to him. Great shot! Just to let you know I have visited and seen your post. I thank you for joining in this week and being part of the Sky Watch community. Great capture for sky watch! And Thank You for the review of Wanted - I've been wondering about how good it is - I'm definitely going to see it now. Congratulations to your husband for a lovely sky photo, and a somewhat belated Happy Birthday to Yossi! What a cute little boy!